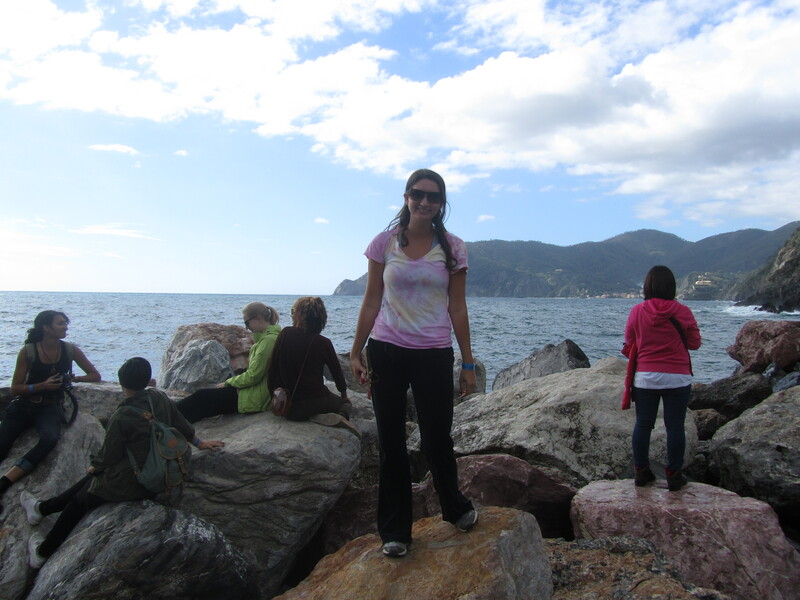 Bespoke Traveler contributing blogger, Lisa Glover, hikes Cinque Terre to gain perspective. During the early weeks of my semester in Italy, I was one of those American-exchange students that would start the first two words of a sentence in Italian, and then have to finish the rest in English. Learning Italian was a struggle for me. I was the only student out of the twelve in my Italian course who hadn’t taken Italian in high school, and my professor moved at a quick pace during lessons. I didn’t do well reading maps of Florence either; I eventually knew my way around using landmarks like knowing which cafes to turn at or what statues led to certain streets. So the fact that during the first 36 hours of being in Italy, I got lost and missed the 6am bus for the first weekend excursion… shouldn’t really come as much of a shock. My entire semester of traveling was practically booked before I even left America. My friends and I scheduled trips in advance so that we could maximize our weekends and see the most of Europe. We were given two weekend excursions that were built into our program costs. It was on a first-come first-serve basis and I was the only one out of the seven girls I lived with who made the roster for Cinque Terre: my top choice. 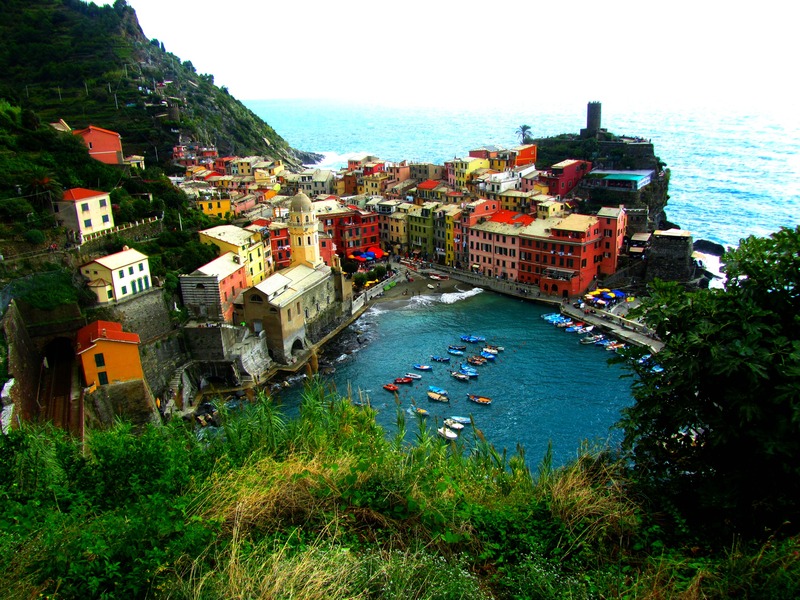 Composed of five picturesque towns, Cinque Terre is a hiking attraction for tourists. Riomaggiore, Manarola, Corniglia, Vernazza and Monterosso al Mare make up the towns along the coastline of the Italian Riviera. Some trails are muddy, some are steep and some require you to scale the sides of the cliff and jump from one rock to the next. From what I read when I researched the area, each seaside village has its own unique landscape of raw beauty, consisting of olive groves, vineyards, or harbors. I felt a pull toward Cinque Terre. I crave new experiences and this would be the first hike I had ever been on. Growing up with my grandparents’ summer house on the water, the beach became a part of my identity. I couldn’t leave Italy without experiencing it, but felt like missing that particular weekend also meant missing out on all the memories that the rest of the group would be making together. I was filled with disappointment because this semester was supposed to be my new beginning, my chance to push the boundaries and form my own independence; yet already, I felt like I couldn’t do it. Luckily, one of my friends welcomed the opportunity to arrange a day trip with me during one of the weekends we had planned to just stay in Florence. We booked a tour with Bus2Alps – a travel company that organizes destination packages and trip itineraries for students studying abroad. We met our tour guide and the rest of the group bright and early on a Saturday morning and after about a three hour bus ride, we arrived at our first city: Riomaggiore. Our first path was on Via dell’Amore (Pathway of Love). The history behind the name dates back to the beginning of the 20th century. After World War II, the area of the trail became established as a meeting point for lovers from the two towns on either end of the trail. 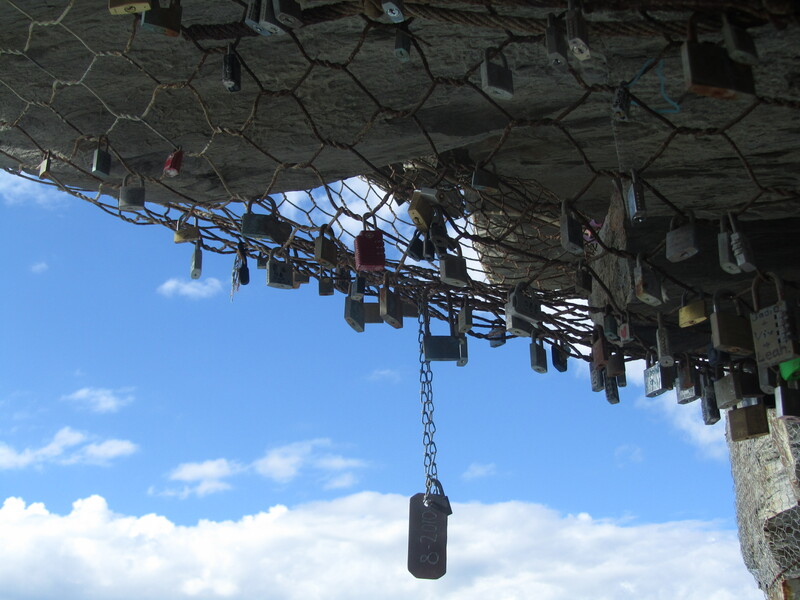 Overtime, couples have taken padlocks and attached them onto the sides of the metal barbed wire, signifying their commitment to each other. The hike along the cliff was breathtaking. 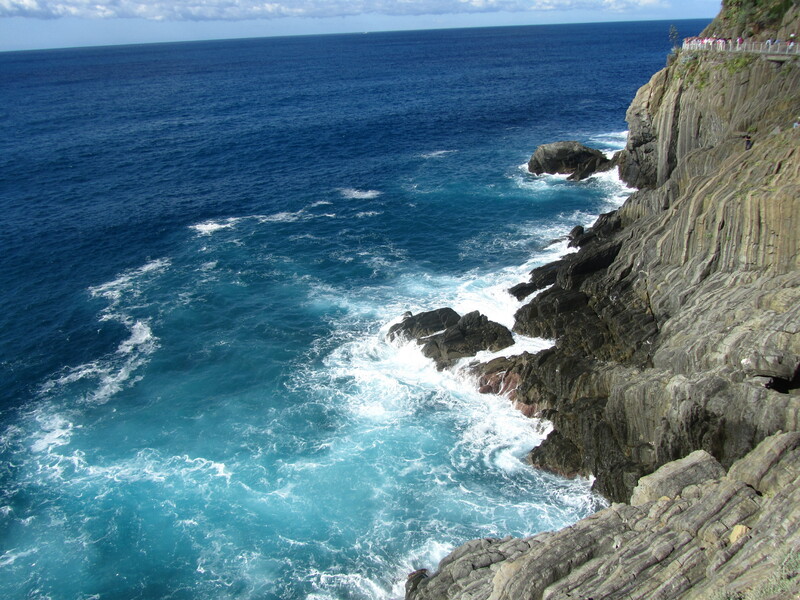 I was mesmerized by the blue waves that crashed against the sides of the cliff and the stunning views that went on for miles. I was captivated by the scenery as we hiked the Sentiero Azzurro (Light Blue Trail) that connects all the towns. We made it to Vernazza, the fourth town, right before a rainstorm came in and set back our plans, making it impossible (because of time constraints and now muddy tracks) to hike through the fifth town. By that point though, we had accomplished about seven miles of hiking and a lunch break was welcomed. Nestled between a few shops was a small, quaint restaurant. Our tour guide insisted that we order a pesto dish because Vernazza is known for its amazing pesto. My gnocchi pesto was outstanding, one of the many authentic meals in Italy that made me feel immersed in the Italian culture. We spent the most time in Vernazza, which is why I remember it as my favorite town. The colorful architecture of the village closes in around a beautiful harbor that leads into the Mediterranean Sea. This is exactly what I had read about, but it had exceeded all of my expectations. Once the rain cleared, we took the train to Monterosso, where we had some time to leisurely walk along the beach and explore some of the shops that were filled with handmade items by local artisans. A day in Cinque Terre is not long enough. Even while I was physically there, I was longing for the day that I’d be able to return. I wanted to share this gem with everyone I knew because it’s a destination unlike anything I had ever experienced before. In a word, Cinque Terre is charming. Each town is a canvas of colors, filled with sandstone buildings that look like they had been dipped in paint – some appearing more weathered than others. As I dragged my fatigued body back onto the bus, I felt an overwhelming sense of appreciation for this opportunity, thinking that it was almost something that I would have missed. Even though I’ll never know what I missed during that first weekend, I’m confident that this hike sparked a change in me and gave me the perspective I had been tirelessly searching for. Having felt overly discouraged for not being able to navigate a map during the first time around, I returned to Florence with a new sense of independence, which carried through during the rest of my European journeys. Lisa, I loved reading this! I have a pretty rubbish sense of direction but figure I can’t go far wrong if I keep the sea in view 🙂 Is the climbing difficult? I’ve always wanted to make this trip, and am reasonably fit. Hi Jo! Thanks for reading. Some of the trails are definitely more challenging than others, but there’s plenty of rest stops along the way to take breaks (and indulge in pesto covered pasta!). It was one of the top 5 memories from my study abroad semester and I would highly recommend the hike. Cinque Terre is incredible and if you’re going to be in Italy, it’s a must! Laura & Sarah – thanks so much for your comments! I’m glad you enjoyed reading about my adventures! Thanks for posting a link to my blog. Also, having recently studied abroad myself, I just wanted to say…. This sentence TOTALLY resonated with me! I basically planned out all my study abroad weekends in advance too! Glad to hear I wasn’t the only one who obsessed about making the best of studying abroad! Sarah, thanks for your comments. It’s always nice to hear that someone else had a similar experience. We hope your time in Cinque Terre was as illuminating as Lisa’s.